Emilie and Alexis Porteret are not from Jura winemaking backgrounds, but have embraced both the place and the profession with great enthusiasm. Having relocated from the Doubs department, this young couple gave up other careers to pursue winemaking. Domaine des Bodines was established in 2010 after Alexis spent several years working part time for Pascal Clairet of Domaine de la Tournelle and Bruno Ciofi of Domaine de la Pinte. 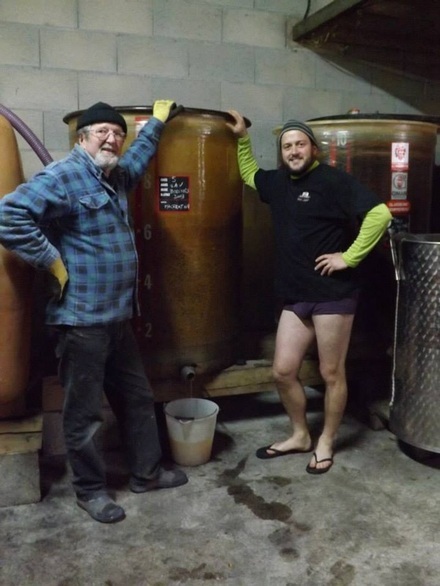 He credits both of these excellent winemakers with having taught him the benefits of organic and biodynamic vineyard work, as well as how to work well and naturally in the cellar. Today the couple share responsibilities at the Domaine and are eager to learn, improve, and continue to grow with the help of family and friends. The Porteret’s three hectares of vines in Arbois came to them from a member of the Frutière Vinicole. Although he’d been applying herbicide to the vineyard, he’d also been plowing, which meant that Emilie and Alexis could undertake conversion to organics with less trouble than some. In addition to their three hectares in Arbois, they have a small plot of Savagnin in Pupillin acquired from our friend Catherine Hannoun of Domaine de La Loue. Alexis would like eventually to convert all his vineyards to biodynamics. Emilie and Alexis’s wines are staunchly natural in style with little to no addition of SO2. The wines begin in tank and are transferred to used foudres and Burgundy barrels. The reds are easy drinking with an emphasis on vibrant fruit, made to be “glou glou,” fun to drink … not too serious. Chardonnay and Savagnin are ouillé and show great purity and zesty minerality. The Porterets also produce a small quantity of Crémant Rosé from Poulsard and Trousseau, which is a glorious example of delicious, natural bubbles.